Home > Keeping Your Mind Active > Can Video Games Keep Your Mind Active? Playing video games can help to keep your mind active during your retirement. Video games in this sense are not the typical action video game. Although some action video games do require you to use logical thinking, playing video games for an active mind tends to involve the more stimulating brain training types that encourage you to work out your brain. 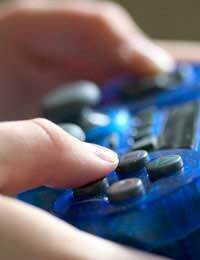 In this sense, playing video games can be an entertaining way to invigorate your mind. There are several educational-style brain training video games that can give your mental abilities a boost. How Can Video Games Keep Your Mind Active? In the case of the electronic brain age games, playing video games can lower your “brain age” to that of a much younger person. Through regular practice, you can theoretically reduce your “brain age” to twenty years old, as this is believed to be the age at which your brain reaches its mental peak. There are lots of different games included in the brain age package, including those based on reading, counting, drawing, word games and Sudoku puzzles. An added bonus of playing stimulating video games is the fact that this is thought to be able to decrease your chances of developing Alzheimer's Disease. Your brain is similar to your physical body in that both require regular exercise to be properly maintained. Just as your muscles tend to deteriorate if they are not used frequently, your mental abilities can also go downhill if your mind is not kept active on a regular basis. What Types of Video Games are Best? Not all video games are equal when it comes to keeping your mind active. Generally speaking, the best types of video game for stimulating your mind are those that force you to repeatedly test your logic and mental abilities. Although this can be true of several of the more traditional video games, it is the brain training video games like the electronic brain age games that are more frequently recommended for keeping your mind active and healthy. Video games are no longer simply mere entertainment. Stimulating video games such as the brain training varieties are a great way to keep your mind active during your retirement. These have become increasingly popular in recent years, particularly the electronic brain age games. These claim to be able to lower your “brain age” to a peak mental age of twenty – provided you practice hard enough on the games! The electronic brain age games span a wide range of games, testing your reading, counting, word game, Sudoku and drawing skills. Research has shown that those who use their brain on a regular basis (for example, by doing puzzles, reading and playing stimulating games) are less likely to develop forms of dementia in later life. This may be a result of your body becoming more resistant to such conditions as a result of frequent mental stimulation.